While origami is undoubtedly a very good medium for making attractively twee designs of birds and animals etc it can also, like any other artform, be used to create much more edgy, less inoffensive, designs. X-rated origami designs of this kind have a long history. 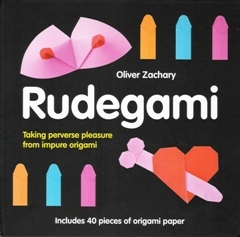 Some of my own can be found in the book Rudegami, which was published under the pseudonym of Oliver Zachary. I seem to have a particular penchant for rudeness with dogs.